Onishi Gallery is proud to present Emi Uchida in a solo show, Trace. In this exhibition, Uchida presents a new body of art in which she builds on the beautiful colors in her former work by adding charcoal lines on top of her colorful oil paintings. Her paintings use fresh and transparent colors echoing watercolor. Her process of laying lines is a way of finding herself through her paintings, which represent both her body and her soul. Whether Uchida’s charcoal lines are thick, thin, quick, slow, strong or delicate, each stroke makes her aware of the passage of time and the singularity of each moment. Uchida considers her lines a trace of both herself and time; each line on the canvas is different and is impossible to replicate. When Uchida’s lines are piled on each canvas, they merge into one unified plane. You and your guests are invited to a special pre launch party in New York to celebrate the occasion of the 4th edition of the PooL Art Fair. Having lunch at the first USDA Certified Organic restaurant in New York and the nation's first restaurant to use 100% USDA Certified organic ingredients can be a unique experience. Because not only the food but everything is organic, even the waiters uniforms and the paper mats on the tables. The only thing that is not organic is the water which is nonetheless purified through a top-notch purification system that takes out metals and toxins, but retains the good minerals and is offered free to the customers. Food is bought from local producers from the New York area while the restaurant stays open from 8am to midnight. 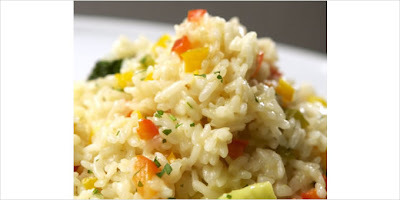 I tried the Risotto, refreshing and simple, a warm taste in a cold day, made only with mushrooms and parsley. The gluten-free penne with pesto and ricotta cheese was made from rice rather than wheat, another tasty dish with a more alternative approach for demanding dieters. Finally, I tasted the newly made quiche with tomato, mozzarella and basil, extremely light with minimum oils and a thin crust which made it an ideal lunch choice. I couldn't leave without giving a go to the natural fruit blends. I first tried the yellow Suave made with peaches, orange juice, agave and ice and I sipped the Rojo made with strawberries, orange juice, agave and ice, both full with vitamins A, B and fibers. Have a drink like this a day and you won't need supplements again! While enjoying my green lunch, I noticed that this organic eatery is particularly popular with mothers and toddles due to the natural, organic ingredients and the quiet, relaxing environment. I learned that Gustorganics offers fresh baby meals daily, a nice surprise a mother wouldn't say no to. Just before leaving the elegant restaurant at the corner of 6th Avenue and 14th Street, and with a final glance at the printed with soy ink brown paper menu, I made a stop at the price list: the experience does not come cheap but with the exceptional quality, the service and the environment, you will break even. Have a look at the pictures to witness that good quality chocolate is never out of fashion: Director of Creation and chocolate/pastry chef Gilles Marchal is preparing his gorgeous cups of bittersweet pleasure, guests are waiting to enter the store in Wall Street, and more guests are just enjoying themselves with prosecco, canapés and of course chocolates and macarons! Well done Maison Du Chocolat! We love you! The Strand Bookstore, a New York institution since 1927, has one of the largest, most comprehensive collections of photography books in the world. The Strand has partnered with Aperture and Pratt Institute Center for Continuing and Professional Studies (CCPS), to host a photography contest, Eye on the Strand. Amateur and professional photographers alike from all over the world are invited to submit their photo representations of the Strand Bookstore for a chance to win an afternoon with internationally-renowned photographer Mary Ellen Mark, a collection of fifty photobooks published by Aperture, and more. A group exhibit Pratt CCPS Gallery in the summer of 2009 will include all of the winning images. Aperture, Pratt, and the Strand will host a reception with Aperture photographers at the Strand Bookstore to celebrate their work and launch the contest. 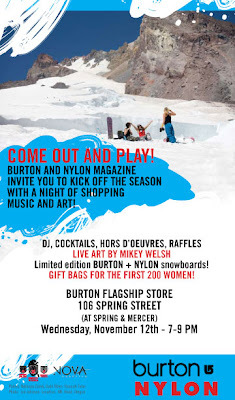 Aperture artists scheduled to attend, sign their books, and mingle with fans include Catherine Chalmers, Michal Chelbin, Donna Ferrato, Paul Fusco, Walter Martin and Paloma Muñoz, Stephen Shames, and Hank Willis Thomas, among others. The Eye on the Strand photo contest will run from November 6, 2008, through February 27, 2009. Fiorentina De Basi shows her adoration for street art through mixed media photography. Putting together unlikely images commenting on society through urban goggles if you will. Her works are inspired by other artist she calls revolutionaries, to whom she pays homage in the series. 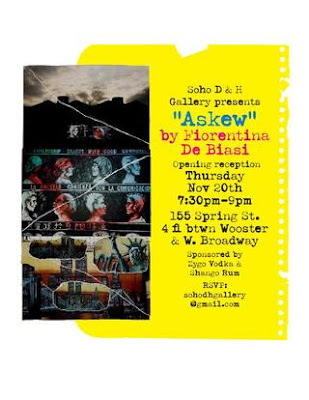 Join us in the opening reception of "ASKEW". You and a guest are cordially invited to join us for a tasting of the World’s Most Precious Whisky - The Macallan. At this private event, you’ll discover the heritage and traditionof several of The Macallan’s finest single malts. 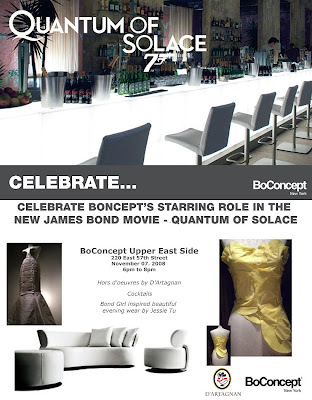 We look forward to sharing an evening with you. Please click below to learn more and find an event in your area. 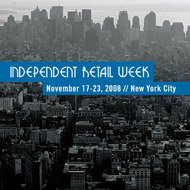 November 17–23, 2008 invites you to shop, indulge and be pampered. 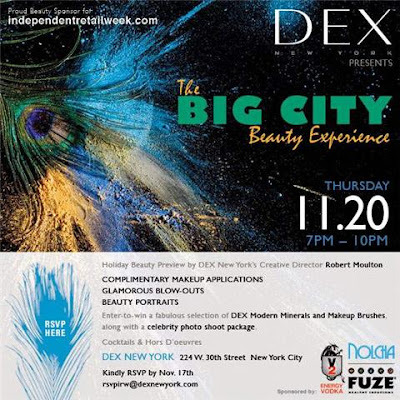 Some of New York City's best independent stores in fashion, beauty and accessories offer you selected services and products at 20% discount. Tuesday, November 11, 2008, 5:30 to 7:00 p.m.
- a rich but nutty chocolate brand (Berkshire Bark) for those who love nuts and chocolate. Try the Midnight Harvest, a combination of Belgian dark chocolate, roasted almonds and hazelnuts, dried cranberries and fresh orange zest, a Real Poem of taste! - the arrogant presence of the World Famous Chocolates but without samples (I really wanted to try the famous Callebaut, which actually did during the wine and chocolate pairing seminar). With my stomach full and my taste satisfied, I have to say that Food Festivals are indeed an invitation for the senses but a challenge for moderation. Despite my good intentions, I can't still manage moderation - maybe this will be my goal for the next Tastings festival. Who knows, I may succeed!